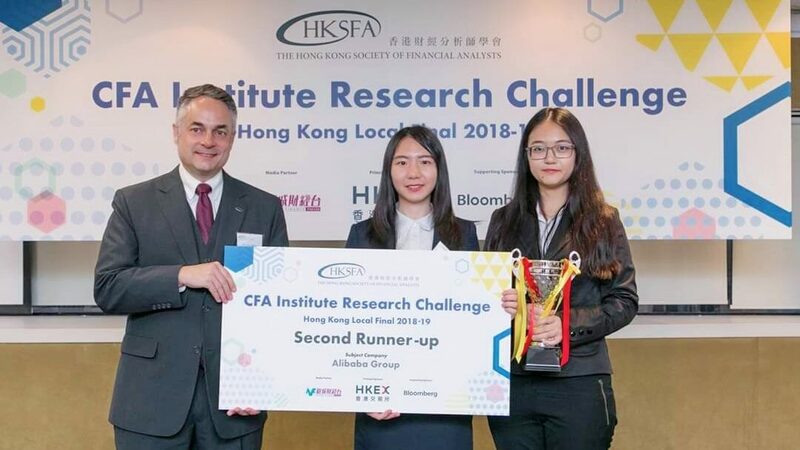 A team of master’s students representing The Chinese University of Hong Kong (CUHK) Business School won the Second Runner-up Prize at the Hong Kong regional round of the CFA Institute Research Challenge 2018-19. The winning team members Cheng Meng, Hu Qianqi, Wang Hanzi and Zhang Chaoqing are all students from the full-time MSc in Finance programme. This prize is a recognition of their outstanding presentation and analytical skills throughout the Final Round. CFA Institute Research Challenge is an annual competition aimed at university students testing their ability to conduct in-depth analysis of a listed company, with hands-on mentoring and intensive training in financial analysis delivered through the CFA Institute network. Students gain real-world experience as they assume the role of a research analyst and are assessed on their ability to value a stock, write an initiation-of-coverage report, and present their recommendations.